It looks like Align Crops will be uploaded next week. 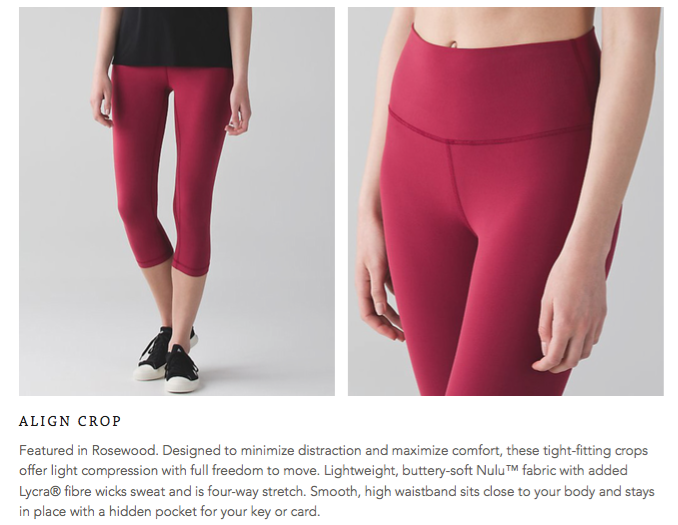 I didn't include it but the text for this week talks about how lululemon "rushed" production of the crops after the tights came out. It really took 7 months to come out with a crop version of the Align Tights? I'm a bit incredulous. There are subtle differences between the Tight and the Crop - no double hem on the waistband, the gusset is different,and it sounds like the leg opening is a little different. The Bliss Break Tank is new but the other two items, the Pure Practice Tight and Bra, have hit foreign markets already. Another week my wallet will be safe. The tank other than being pima cotton is just another version, mind you plainer, than the Var City Tank and Making Moves Tank. Why hasn't Stop At Nothing come to North America yet??? Not into the Rosewood colour, it looks like another fall colour making it's debut in spring. that red looks like fall, not summer. and seriously 7 months for a design on crops? which beside the same material, they don't even look like the pant. I know we both want more SILIH, I guess making one in white would take a year! I'd die for that bra in white, light pink, light green, flare...basically anything spring like! I refuse to buy the tranquil pink wmtm top (i love tranquil top for hot) because I don't have a cute bra for under it, due to the pink/white combo. Just saw the Align crops in the Virginia Beach store yesterday! i heard in store that all aligns will now have no band at the waist and will also have the same inner seam as the crops do. i'm glad i got 1st runs. @anon 3:14 pm - good point about the Stop At Nothing. @Casey - I know! I think the True Selfs are only in Canadian studio stores right now. @ anon 7:14 pm - the crops and tights have the same inseam? That is weird. LLA by now I'm sure you realize she wrote inner (pause) seam, not inseam. Gave me a laugh. LuluAddict, I think Anon @7:14 meant that the gusset would be the same. It would be really weird for pants and crops to have the same length inseam. Hmm, guess if I want some Aligns, I should buy them quickly. I like the double stitching at the waistband. The crops look really plain. As far as Rosewood, unfortunately, I'm seeing it in other stores, too. Someone decided that dark red and dark purple are the "it" colors for Spring. Wishing the designers exercised a little common sense. I don't care if it's a trend, I'm not buying cranberry red in April. 7 months would be rushed. Fast fashion (i.e. Forever 21/H&M) takes 3-ish months to go from design to floor. Normal fashion takes almost a full year to go from design to showroom floor - usually around 9-10 months. It easily takes a month or so to cross the ocean in the container ships from wherever it's being sewn. Due to the changes from the pant to the tight a whole new pattern had to be made, pinned, sampled, fixed, re-made with changes etc. All before production could start. It's how fashion works. Fall/winter items for 2016 are probably here already and they are already in design and production for next spring/summer 2017. This is why when an item in a print wasn't made and posts on HeyLululemon are asking for something in a current print - it doesn't happen. What's made is what was ordered 10+ months ago and if it isn't there, they can't all of the sudden make it appear nor can they all of the sudden put in an order for it. Even if they did it by the Fast Turn team it would still be 3-4 months and by then they are already onto another color palette. I need spring colours! No more darks 😃 Who has the boom juice long sleeve swiftly? I am thinking I need a nice colour but can't decide between BJ or some of the other pinks (heathered pink paradise, flashlight). What are your faves? @ anon 7:40am - Very interesting. I wonder why they didn't develop Align Crops and Pants at the same time. That is what puzzles me. I believe that would be the million dollar question. Lack of foresight, testing the waters on the nulu fabric maybe? I believe these came out at the price change and "feeling" marketing change so possibly they wanted to see how well received it would be and also how they held up - which we know they already did a fabric change since the first release pilled horribly. I have to say I question a lot of their design and other choices that they make pretty much daily so actually not surprised at this. It seems to be for a company as old as Lulu and with Potdevin (however you spell it) at the helm with decent clothing experience that stuff like this wouldn't get overlooked. Though I do know he recently brought new people on board so maybe he is working to fix these types of issues. Not fast enough IMO though my opinion probably matters squat. Lol! I remember when the Align Pant first dropped, an educator telling me the company didn't have enough "newlu" fabric to support the demand. That's why so many stores (mine included) were so slim on sizes and didn't get enough replen to keep them adequately stocked. Something to do with limited factories having the capability to make the fabric... Maybe that's why they didn't do the crops at the same time. @ anon 1:23pm - It may be the fact that the company sells more pants than crops. I live in Southern California so I own very few pairs of Wunder Under Pants since they're way too warm for me to work out in 99% of the time. I have a few pairs of herringbone or coco pique for our "winter" but they only get used a couple months out of the year for casual wear only. It just seems odd to me they weren't brought out at the same time since they were to be a new core item. I have it and looooooove it. It is my favorite pink, though the pink paradise is nice as well.